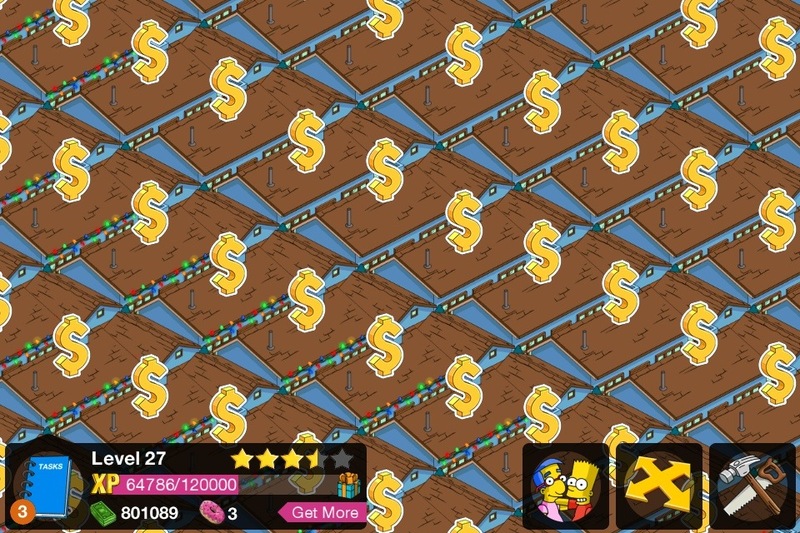 Quickly earning money in Simpsons Tapped Out with houses | Christoph Bartneck, Ph.D. I am playing Simpsons Tapped out and based on the data at the Simpsons Wiki, I confirmed a suspicion I had for some time. 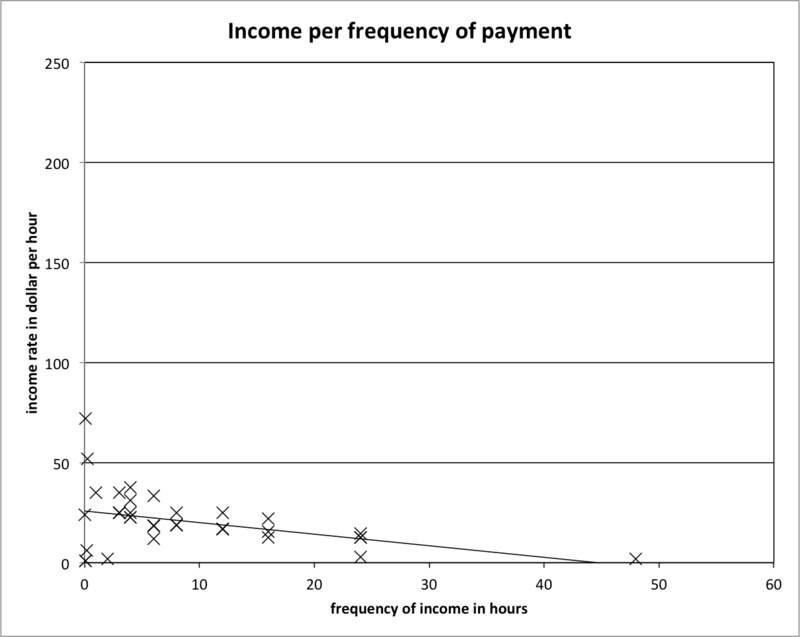 The houses in Springfield are setup so that the houses that give you income at a higher frequency also give you the highest hourly income rate (see figure 1). 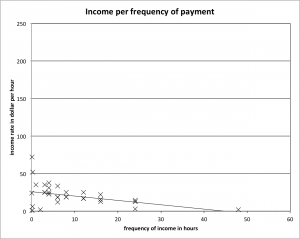 This means that the more often you have to tap on a house, the higher your hourly income. You are being rewarded for wasting your time in this game. I was also interested in when houses break even. There is a dramatic difference and in terms of the time it takes and the number of taps you have to do. Remember, that some houses require you to tap them every few seconds. I consider the blue house as the best investment. It is cheap, gives you a decent amount of income and you you do not have to tap it too often. Moreover, you can squeeze exactly eight houses in one square. The purple house is the next best choice if you play more frequently and have the energy to tap the house every three hours. You might want to add in build time, of the house, as well? Your out the amount of money it costs to build the home for that time, so you might as well figure it in. Love this article. I had done the math too, and figured out anecdotally that I would be cashing in blue houses twice a day (at 150 each time). I had also considered the pink houses, which has 6 hours before each cash-in, however the payout each time is 110, and though I could cash those in three times per day, it was worth almost the same as the blue. Another factor that I considered when buying houses was the square footage, or rather the number of units each house took up. The pink was arguably the same payout as blue, however it also took up 25% more land than the blue (blue is 8×4 units where pink is 8×5 units). Considering the square footage, one could argue that the white houses are the best bet, since they only occupy 4×6 units of land. However the initial cost would take a LONG time to pay off before it generated any positive income. I’ve already persuaded a couple people to avoid White House farming for that reason. Conversely the brown houses are super cheap, but at only a few bucks per payout one would need to play pretty much non stop all day to make that worth their while. Thanks for the article. if you wish to add me, my user is JackalFive. Cheers. It all depends on how you want to play the game. I can only afford to play it once or twice a day and hence blue houses are the best for me. With only a few taps you get a lot of money. I also refuse to pay for donuts. This applies to blue and purple too. Blue’s earnings per acre per hour is pretty much exactly the same as purple’s even though it requires more work. Factor in the rising land values, then blue is starting to look like a better and better deal. Optimal conditions, and a going rate of 50k per acre, puts blue at, I think, about 8 days to break even and purple 4 days. After that, you get the same money for less clicks, per acre. Which means that blue is preferable to purple for reaching, say, 10,000,000. Of course, purple is by far the best house to plant when starting off, at about half the price of blue and really low land prices. The best strategy is probably to start with purple and slowly transition to blue, I’m guessing when land values hit 50k. Do your calculations include the equity you have in your home? E.g. I can sell a purple house for 275. They cost 1100. Once I generate 825 cash, I’ve broken even because I have 275 in the house itself. 825 cash is 11 taps at 3 hour intervals. Dear Boris, I did not consider the sales price for the houses. I never sold a house. Never had the reason to. All the houses except orange and brown have something to recommend them, but I am coming to the conclusion that, counterintuitively, white is the way to go. Blue is optimal if and only if you can get in all three taps a day at 8 hour intervals. Personally, I find this makes me a slave to the game in an only slightly less annoying way than having to tap brown houses every 5 minutes. If you find it effortless to fit the blue houses’ 8-hour timetable into your life, read no further: blue is right for you. Personally, I am more likely to tap blue houses twice a day, for $300/26 XP. That level of yield makes pink and purple at least as good as blue for me, and likely better most days. So why do I think white is best? The big selling point: thanks to its 12-hour timetable it is easy to tap twice a day for maximum yield without having to schedule one’s play too carefully. Assuming only two taps/day for both blue and white, every day a white house provides an extra $100 and 14 XP. It would thus take 59 days for a white house to recoup its extra $5900 cost vs. a blue one. That’s a long time, but considering the long-term nature of this game I’m willing to accept it. In the first year, each white house will out-earn each blue house by around $30,000, and $36,000 thereafter. If we are looking at house farming, that means 100 white will generate $3.6 million more/year than 100 blue. Not to mention the extra XP both daily and on construction. More XP = faster bonus levels = more free donuts. PS: why I think blue is best even if I only can tap it 2 times a day sometimes? blue gives you a certain timeframe, which also is great if you work in shifts like me, that differ 2 hours each week :-). can tap them earlier the one, and later the other week without losing much…. I prefer the brown house…and lots of them. now, I know that it has the lowest payout, but with the lowest cost and fastest construction time, I was able to buy enough houses and land to make it worthwhile. In my down time, when I REALLY have nothing to do, I can make some good money. 147 houses at $7/house every 5 minutes gets me $1029. 12 taps per house per hour gets me $12,348. that very quickely adds up. I have found myself with some spare time on my hands while waiting for computers to do things, so this is ideal. I won’t always have this time, but while I do, I’m making a lot of money to help grow my city. Here’s the way I figured out which houses would work best for me; this might work for others since I have a pretty average routine. I usually only have the time to play 2-3 times per day, usually on the subway or while settling down for bed. For me it’s a decision between the Blue and White houses. The Brown house is a waste of time, the Pink and Purple houses take up a lot of space, and the Orange house is just a rip-off. The White house pays out $200 every 12 hours, for a max of $400/day. However, as I am highly unlikely to play the game every 12 hours exactly, I will probably lose a harvest every few days. Figuring that I would lose a harvest every 3 days, I would make approximately 50 harvests/month for a total of $10,000/month for every White house. The Blue house pays out $150 every 8 hours for a max of $450. I can get 2 harvests a day, easy. I can usually harvest while commuting to and from work, and every few days I figure I stay up late enough to get in a third harvest before bed. So figuring I could make a 3rd harvest every 3 days, I can make around 70 harvests/month for $10,500. I’ll use these estimates for the rest of my calculations. In this case Blue houses work best for me because it fits my schedule rather than having to fit my schedule to the game, which is just silly. Scheduling aside, the houses are approximately equal concerning yields. The extra $500 with the Blue house can be written off as a margin of error, since my estimates are inexact. This makes the decision a matter of start-up cost vs land usage. In the beginning, land is cheap and money is short, so Blue houses are by far the quickest way to make money if you don’t feel like spending your whole day tapping: 8 Blue houses will fit on a single square of property and costs $14,400 and will pay for themselves after 5-6 days, producing $84,000/month of profit per square. That same amount of land can hold 10.7 White houses, at a cost of $82,390 and taking around 21 days to break even, producing $104,000/month per square. White houses produce more profit per square, but you could fill more than 5 squares with Blue houses for the same price, making much more profit in the beginning. This is not counting land costs. The first few squares are cheap and don’t factor much into the start-up cost equations. As the cost of land goes up, the matter of start-up costs decreases, and land usage becomes the biggest factor. By the time land costs $69,000/square, White houses and Blue houses take the same amount of time to pay themselves off, and White Houses actually take less time to break even than Blue houses on land costs over $69,000/square, although White houses still require more money up front. However, by the time you’re paying that much for land, you should have so many houses to harvest from that start-up money is no longer much of an issue. Since White houses give a higher profit per square, you should choose a point somewhere before the $69,000/square mark to start building White houses to maximize long term profits. Where that point is I have no idea, but as soon as you can easily start buying up squares full of White houses, you should do so. Here’s a partial chart showing the number of harvests needed to break even at different land costs. Another thing to consider is how bonuses kick in. My first experiment has been farming Brown houses. I have 100 of them. I’ve also spent every donut the game didn’t force me to waste on something else on white picket fencing. I think of the sea of Brown houses as a Section 8 neighborhood and walled it off with picket fencing. Thanks to the picket fencing, Homer’s hammock, and the free burning bush, the actual value of the Brown house every five minutes is $7 and 2 XP. This makes for $8400 and 2400 XP every focused hour. I’m primarily trying to get a head start on land acquisition. Once I’ve bought all of the land in the valley along with the water sections for Squidport, I’ll start converting the houses to models that require less intensive play. Thus far I’m at level 14 with 12000 XP towards the next level, Willie’s shack is under construction, and I’ve purchased about half of the $19000 land sections. Epobirs, great tip about the bonus objects. I had a bunch in storage. I went back and checked which make bonus points and pulled them back out. So say I can’t go tap my brown houses every five minutes, does the money keep accruing until I can tap them or do they stop accumulating money? I’m trying to figure out which houses would be best for me to farm because sometimes I play a lot but other times I’m too busy to touch the game for several hours. Mel: No, the money is a constant amount until you harvest it. Eg the brown houses – if you don’t harvest for a week, they’re still only worth $7 each. I agree that Blue Houses are the “best” option. I make my blue houses in blocks of 30 houses at a time. Now I am not counting land costs because they are all different varying amounts and increase as you expand. This is a normal cost as it is. I know that the house farms take up land but in the very end, one of the goals is to unlock all the land at some point regardless, right? At least I know it is for me. So with the idea that unlocking land is happening regardless of house farming, my 30 block of blue, as I call it, brings in 13,500 a day if I tap it 3 times a day. I don’t know about everyone else, but I’m generally awake 16-18 hours a day and sleep 6-8 hours a night. There are times I sleep more, and unfortunately there are also times I sleep less, but generally I can get in 3 taps a day with my block of blue. Doing this, I have fully paid for my block of blue in 6 days. I’ll round this off to a week (maybe a harvest or 2 was missed). After only 1 week, the 13,500 a day is purely surplus. Worst case scenario you are only tapping twice a day and getting 9,000 a day. I never had the need to house farm until I hit around level 15 at which point I had my entire house farm built in a single day when I decided to get it done, cashing in on it the following day for the first time. So I really don’t see the point in starting out with any of the cheaper houses unless you are just wanting something to do. I’m about to hit level 20 now and have had more than enough money to buy anything I need but I do sense that I may need to make a 2nd, and perhaps by the end of the game a 3rd or 4th block of blue before it is all said and done. A good tip if some of the houses income is earlier. Just put all you houses in inventory and then place them again and then they will reset. I just completed some analysis in Excel and arrived at the exact same conclusion. Blue, then Purple. After feeling all proud of myself, I realized there was this thing called the internet that probably has the answer. I should have checked here first! Nice job. Interestingly enough, I came to this same conclusion and use the same blue houses. Although, I can really only get 2 taps a day out of them because… sleep. However, they changed the price system for houses and now the price escalates. This is retroactive as well. Blue houses will now set me back $210,000 apiece. For those who doesnt have huge amount of money to use bloodmobile, wheather station or netball buy and resell things to earn much XP..here some tips..
Wheather station cost $9500 and give 1000XP each.Resell each station is $2375 each. To get 50000XP you need 50 wheather station which will cost $334875 after reselling all the station bought..
KWIK-E-MART price is according to the number of the mart you have..it start from $220..it build up in 4 hours and five 2000XP..if you want to get 50000XP in bulk you just need to buy 25 of the mart range from $220 to $12400 per mart which cost ONLY $75770 not including the resell money yet..
Ofcourse it takes longer time to harvest which is 4 hours for completing the building but believe me it takes longer to make millions of $$$ just to do it instantly especially if we not premium user..